The Conference Center, in Salt Lake City, Utah, is the premier meeting hall for The Church of Jesus Christ of Latter-day Saints (LDS Church). 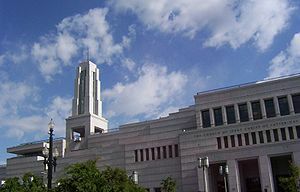 Completed in 2000, the 21,000-seat Conference Center replaced the traditional use of the nearby Salt Lake Tabernacle, built in 1868, for semi-annual LDS Church General Conference and major church gatherings, devotionals, and other events. It is believed to be the largest theater-style auditorium ever built. Conference Center interior looking towards the rostrum and organ. View of Conference Center spire taken from the south, from North Temple St., Salt Lake City, Utah. The 1.4 million square foot (130,000 m2) Conference Center seats 21,200 people in its main auditorium. This includes the rostrum behind the pulpit facing the audience, which provides seating at general conference for 158 general authorities and general officers of the church and the 360-voice The Tabernacle Choir at Temple Square. The auditorium is large enough to hold two Boeing 747s side by side. All seats in the audience have an unobstructed view of the pulpit because the roof is held up by radial trusses. The balcony is supported by a series of 34 cantilevers. This construction method allows the balcony to sink 5⁄8 inch (16 mm) under full capacity. Behind the podium is a 7,667-pipe and 130-rank Schoenstein pipe organ. Underground is a parking garage that can hold 1,400 cars. A modernist, three-story chandelier hangs in a skylight in the interior of the building. A waterfall descends from the spire. City Creek flows in a rough-hewn riverbed, complementing the Conference Center. On the third floor of the Conference Center there are busts of current and past presidents of the church and photographs of LDS leaders; photographs of female LDS leaders were added in 2014. Because the building sits near the base of Salt Lake City's Capitol Hill, the roof is landscaped for attractiveness, an extension of the Gardens at Temple Square. About 3 acres (12,000 m²) of grass and hundreds of trees have been planted on the roof. Twenty-one native grasses were employed to conserve water and showcase local foliage. The landscaping is meant to echo the mountains and meadows of Utah. Attached to the main building on the northwest corner is the 900-seat Conference Center Theater that can be used as a dedicated theater or as an overflow room. The design of the Conference Center was accomplished by Portland, Oregon-based Zimmer Gunsul Frasca Partnership, which was the design architect and Auerbach & Associates of San Francisco, which was responsible for theater design and architectural lighting. The designs were solicited by LDS Church architect Leland Gray in the early 1990s, apparently at Gordon B. Hinckley's request. Hinckley was then a counselor in the First Presidency, but became President of the Church in 1995. The LDS Church originally sought a 26,000-seat building no more than 75 feet (23 m) high in accord with zoning regulations for the LDS Church-owned 10 acre (40,000 m²) block immediately north of Temple Square. Hinckley publicly announced the project in the April 1996 general conference. The final plans, completed in late 1996, featured 21,200 seats in the main hall with 905 in the side theater. Contracting for the building was done by three Salt Lake City firms: Jacobsen, Layton, and Okland construction companies which submitted a joint bid in order to compete with national firms. The companies jointly operated under the name "Legacy Constructors" after winning the contract in late 1996. Demolition of existing LDS Church properties on the site began May 1997. Deseret Gym—a YMCA-like gymnasium—and a Mormon Handicraft store had to be razed for the project. Ground was broken July 24, 1997. This date coincided with the 150th anniversary of Mormon pioneers entering the Salt Lake Valley, an event celebrated in Utah as Pioneer Day. Although the Conference Center is a modern steel truss and rebar-based design without need for masonry support, the LDS Church sought slabs of quartz monzonite, a form of granite, to clad all exterior walls. Specifically, the church wanted granite to match rock quarried more than a hundred years earlier to build the adjacent Salt Lake Temple. Therefore, the LDS Church requested a permit to quarry granite from Little Cottonwood Canyon southeast of Salt Lake City. The Salt Lake County Commission granted a two-year permit on condition that extraction not interfere with the ski season. Critics of the extraction argued that the quarry harmed the environment and burdened residents while endangering drivers through Little Cottonwood Canyon below. Quarrying began May 28, 1998. The quarry location was further up the canyon from where stone was extracted for the Salt Lake Temple. Although court filings challenged the legality of extracting the granite (specifically attacking Salt Lake County's authority to issue permit), the project was interrupted only by winter weather. The LDS Church finished quarrying by November 1999. Over 300,000 square feet (28,000 m²) of granite was extracted. The granite was subsequently cut into slabs at a facility in Idaho Falls and used for the facade of the building. There was not enough granite extracted from the Little Cottonwood Canyon quarry for the entire project, so extra granite was brought in from the mid-west and used for the flooring. The exceptionally unusual Salt Lake City Tornado hindered construction on August 11, 1999. Construction cranes toppled at the work site, and four injuries to crew were reported. Otherwise, construction proceeded smoothly and rapidly. Construction was complete enough for the building to be used for the 170th annual church general conference on April 1 and 2, 2000. The pipe organ was not operational, so The Tabernacle Choir at Temple Square was accompanied by a synthesized organ amplified through the Center's speaker system. President Hinckley remarked in his opening address that over 370,000 people had inquired about tickets for the Center's inaugural general conference. President Hinckley also related that a black walnut tree that he had planted decades earlier in his backyard provided wood for the pulpit of the new center. The Conference Center was dedicated six months later, on October 8, during the 170th semiannual general conference. As part of the event, the dedicatory prayer was followed by a "hosanna shout"—a show of gratitude that dates to the early days of the Latter Day Saint movement. The shout involves participants waving white handkerchiefs while repeating "Hosanna, hosanna, hosanna, to God and the Lamb" three times. Though it had been used in public before, such as during the capstone ceremony for the Salt Lake Temple and at the church centennial celebration in 1930, before this public broadcast of the hosanna shout, some assumed it was exclusively related to LDS temple dedications, which are inaccessible to non-Mormons. The Conference Center dedication demonstrated that the hosanna shout, although considered sacred by the Latter-day Saints, is not necessarily used exclusively in temple-related settings. Magnum Opus: The Building of the Schoenstein Organ at the Conference Center by John Longhurst, retired Senior Tabernacle Organist, examines the concept, approval, design, and construction of the Conference center organ seen during general conferences of the church. The book contains color pictures and an audio CD with narrative by the organ builder and music illustrations by the Tabernacle organists. Rooftop view. Salt Lake Temple visible in background. ^ a b "Temple Square Events". LDS.org. LDS Church. Retrieved 26 August 2014. ^ Searle, Don L. (October 2000). "The Conference Center: "This New and Wonderful Hall"". Retrieved 26 August 2014. ^ "Tabernacle Choir Getting to Know Unique Conference Center". News from the Church. Retrieved 2009-02-11. ^ Charlton, Nathan (October 2000). "Building to Last" (PDF). Modern Steel Construction. p. 3/5. Retrieved 10 March 2016. ^ "Visitors' Centers". Lds.org. Archived from the original on 2010-11-25. Retrieved 2012-01-01. ^ Hunt, Kathie (July 14, 1999). "LDS Church given approval to extend quarry". Daily Universe/BYU NewsNet. Provo, Utah. Retrieved September 3, 2018. Halverson, W. Dee (2000). The LDS Conference Center. Salt Lake City: DMT Publishing. ISBN 978-0-9705023-0-8. OCLC 45206328.